At the end of the war an English officer leading a clearing party through northern France discovers a dead soldier in a trench. In the man’s possession is a secret love note, tucked inside a tin of chocolate that had been sent to the soldiers as a gift. 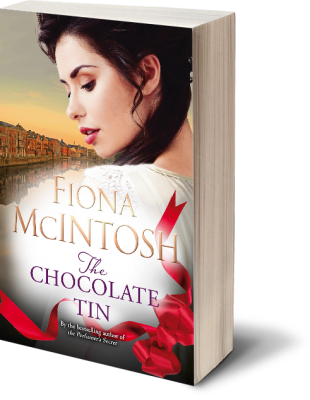 In pursuit of the author of this mysterious message, Harry travels to Rowntree’s chocolate factory in England’s north, where his life becomes inextricably bound with a couple, Alexandra and Matthew. Only together will they be able to unlock secrets of the past and offer each other the greatest gift for the future. This is a heartbreaking tale about a triangle of love in all of its forms and a story about the bittersweet taste of life…and of chocolate. The image (right) is the original chocolate tin I held in York, when the story came crashing into my mind. 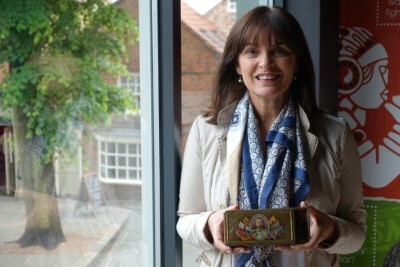 This is one of the chocolate tins retrieved from the WWI battlefront. THE SMALL PAPERBACK VERSION OF THE CHOCOLATE TIN WILL BE RELEASED IN APRIL 2017. IDEAL FOR MOTHER’S DAY.